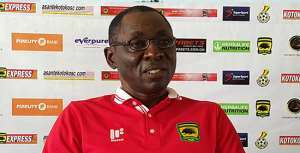 Former Asante Kotoko coach David Duncan has expressed his interest in returning to the club. The head coaching role of the Kumasi-based giants became vacant on Friday following the sacking of head coach Steve Polack. The Englishman lost his job after failing to guide the Porcupine Warriors to the second round of the CAF Confederation Cup competition after they were eliminated by Congolese side CARA Brazzaville last Wednesday. And Duncan, who faced the same fate two seasons ago as coach of the club, has thrown his hat into the fray as he seeks to succeed the former Berekum Chelsea trainer ahead of the coming season. "If Kotoko needs my services, I will gladly go because coaching is not a demotion," Duncan indicated on Happy FM's Wamputu Sports. Meanwhile, Kotoko are reported to be on the verge of appointing Samuel Paa Kwesi Fabin as Polack's replacement.